The on again, off again relationship between guitarist Omar Rodriguez-Lopez and vocalist Cedric Bixler-Zavala is now on again. 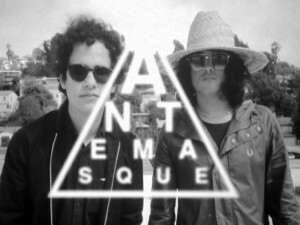 Setting aside whatever differences surfaced toward the end of At The Drive-In’s 2012 reunion tour and led to the breakup of The Mars Volta in 2013, the pair have now reunited to form a new band called Antemasque. Filling out the band’s lineup is Red Hot Chili Peppers bassist Flea and former The Mars Volta drummer Dave Elitch, who has also recently resurfaced in the metal supergroup Killer Be Killed. Their first released song is “4AM,” a fun little rock tune that abandons the more progressive sounds of The Mars Volta. The riffs sound like a more lo-fi version of At The Drive-In, while Bixler-Zavala explores his lower octave with some less bombastic vocals than we’re accustomed to. The track is currently available on iTunes and can be streamed below.